Have you ever thought that the cold winter weather you were experiencing was going to be great because it would kill off <insert the bug you hate most here> and you wouldn't have to deal with them when it warmed up? I know I've heard it before and I've heard the opposite as well. A warm winter will not kill off the bugs and we will have more mosquitos and ticks and such. Is this true? It turns out we are all wrong. The words entomologist and meteorologist may sound the same, but we are quite different types of scientists. While the Meteorologist studies weather, the Entomologist studies insects. And they say that the temperature isn't the most important factor, moisture is. 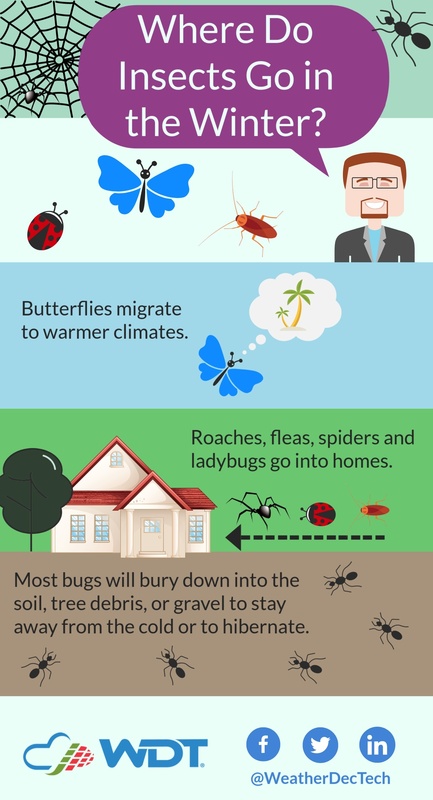 Most bugs will bury down into the soil, tree debris, gravel or warm spots in your garage to stay away from the cold or to hibernate. Other insects, like butterflies, will leave, migrating to a warmer climate. Roaches, fleas, spiders and ladybugs go into homes and hang out with you and your family over the winter. Bet you didn't know you had so many guests. It's moisture that plays a bigger factor in the lives of insects. If it is too wet, that moisture will raise the water table and ants, for instance, will climb higher to avoid it. As they get higher, it gets colder and some will die. Yet there are plenty more to replace those unfortunate ones. More moisture can also provide more spots for mosquitos to lay eggs. Just because it is a warm winter, that doesn't necessarily mean that a bug population will be larger. Some bugs may come out of hibernation too early and not find their food source around and therefore starve. Although, warm winters can lead to more ticks. In the long run, there are many factors that go into why we sometimes experience more of one insect than we have in previous years. And yes, they can definitely cause problems from Lyme disease to the destruction of crops. Insects have been around a long time, they have learned how to handle the winter. One thing's for sure, don't count on a cold spell to solve your insect problem.